On Good Friday, the entire Church fixes her gaze on the Cross at Calvary. Each member of the Church tries to understand at what cost Christ has won our redemption. In the solemn ceremonies of Good Friday, in the Adoration of the Cross, in the chanting of the ‘Reproaches’, in the reading of the Passion, and in receiving the pre-consecrated Host, we unite ourselves to our Savior, and we contemplate our own death to sin in the Death of our Lord. The Church — stripped of its ornaments, the altar bare, and with the door of the empty tabernacle standing open — is as if in mourning. In the fourth century the Apostolic Constitutions described this day as a “day of mourning, not a day of festive joy”, and this day was called the “Pasch (passage) of the Crucifixion”. The liturgical observance of this day of Christ’s suffering, crucifixion and death evidently has been in existence from the earliest days of the Church. No Mass is celebrated on this day, but the service of Good Friday is called the Mass of the Presanctified because Communion (in the species of bread), which had already been consecrated on Holy Thursday, is given to the people . Traditionally, the organ is silent from Holy Thursday until the Alleluia at the Easter Vigil, as are all bells or other instruments, the only music during this period being unaccompanied chant. The omission of the prayer of consecration deepens our sense of loss because Mass throughout the year reminds us of the Lord’s triumph over death, the source of our joy and blessing. 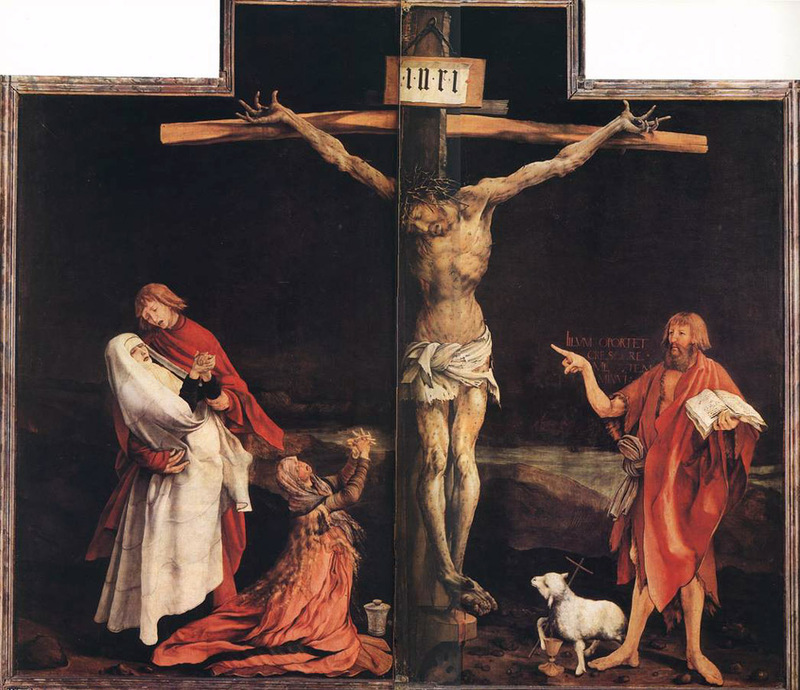 The desolate quality of the rites of this day reminds us of Christ’s humiliation and suffering during his Passion. 1. the Liturgy of the Word — reading of the Passion. 2. the intercessory prayers for the Church and the entire world, Christian and non-Christian. King Sapor of Persia, in the year 327, the eighteenth of his reign, raised a bloody persecution against the Christians and laid waste their churches and monasteries. 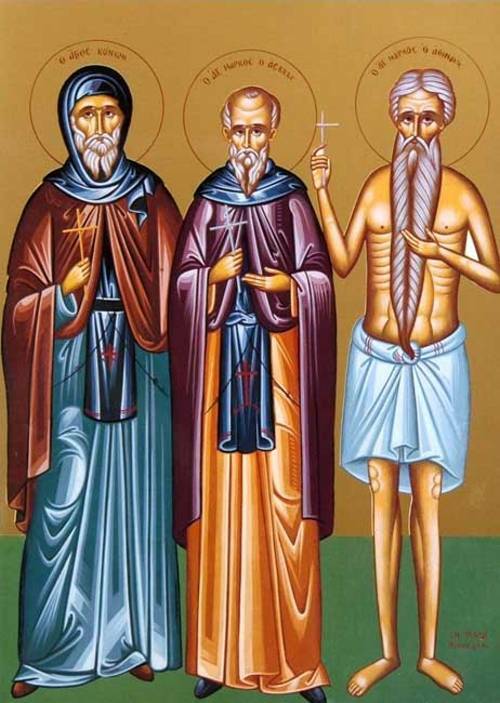 Jonas and Barachisius, two brothers of the city Beth-Asa, hearing that several Christians were under sentence of death at Hubaham, went there to encourage and serve them. Fear not, brothers, but let us combat for the name of Jesus crucified, and like our predecessors we shall obtain the glorious crown promised to valiant soldiers of the Faith. Fortified by these words, nine of that number received the crown of martyrdom. 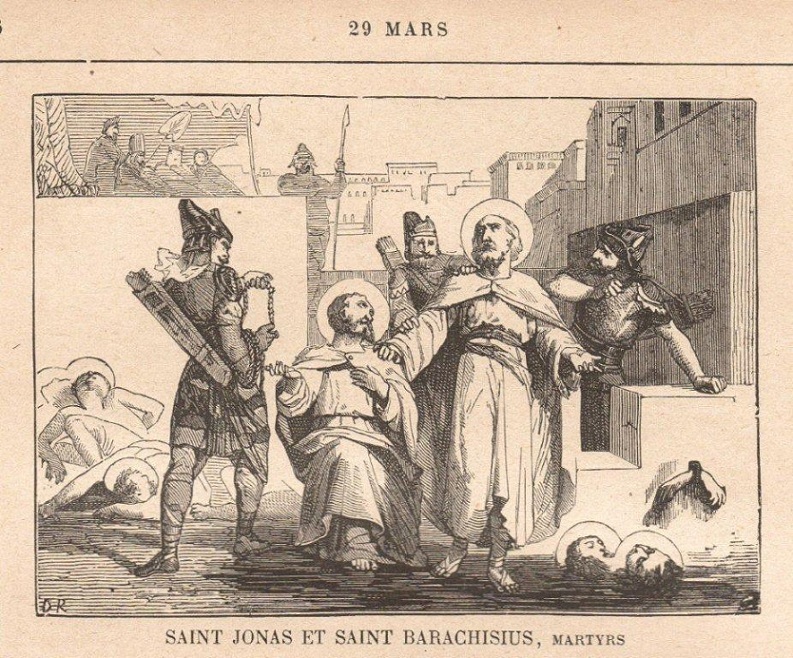 After their execution, Jonas and Barachisius were apprehended for having exhorted the martyrs to die. The president entreated the two brothers to obey the king of Persia, and to worship the sun, the moon, fire, and water. They answered that it was more reasonable to obey the immortal King of heaven and earth than a mortal prince. Saint Jonas was beaten with knotty clubs and with rods until his ribs were visible, but he blessed God. Then he was chained by one foot and dragged to a frozen pond to spend the night there. Saint Barachisius had two red-hot iron plates and two red-hot hammers applied under each arm, and melted lead dropped into his nostrils and eyes; after which he was carried to prison, and there hung up by one foot. Despite these cruel tortures, the two brothers survived and remained steadfast in the Faith. New and more horrible torments were then devised; both finally expired under a terrible press. They yielded up their heroic lives, praying for their enemies, while their pure souls winged their flight to heaven, there to gain the martyr’s crown which they had so faithfully won. “Before the feast of Passover, Jesus knew that his hour had come to pass from this world to the Father. He loved his own in the world and he loved them to the end. 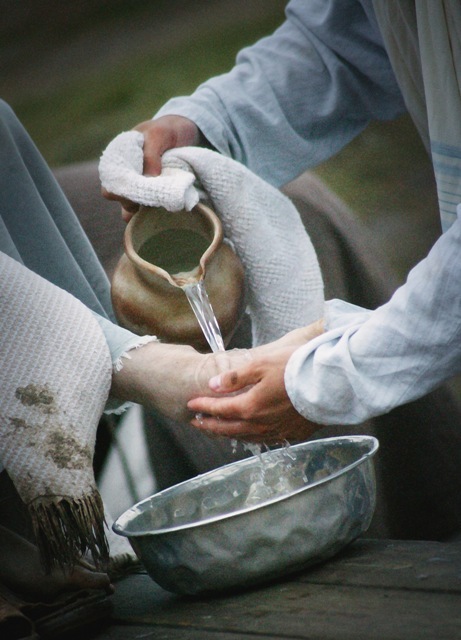 Then he poured water into a basin and began to wash the disciples’ feet and dry them with the towel around his waist. So when he had washed their feet (and) put his garments back on and reclined at table again, he said to them, “Do you realize what I have done for you? If I, therefore, the master and teacher, have washed your feet, you ought to wash one another’s feet. I have given you a model to follow, so that as I have done for you, you should also do.” -John 13:1-15. Holy Thursday is the most complex and profound of all religious observances, saving only the Easter Vigil. It celebrates both the institution by Christ Himself of the Eucharist and of the institution of the sacerdotal priesthood (as distinct from the “priesthood of all believers”) for in this, His last supper with the disciples, a celebration of Passover, He is the self-offered Passover Victim, and every ordained priest to this day presents this same sacrifice, by Christ’s authority and command, in exactly the same way. The Last Supper was also Christ’s farewell to His assembled disciples, some of whom would betray, desert or deny Him before the sun rose again. 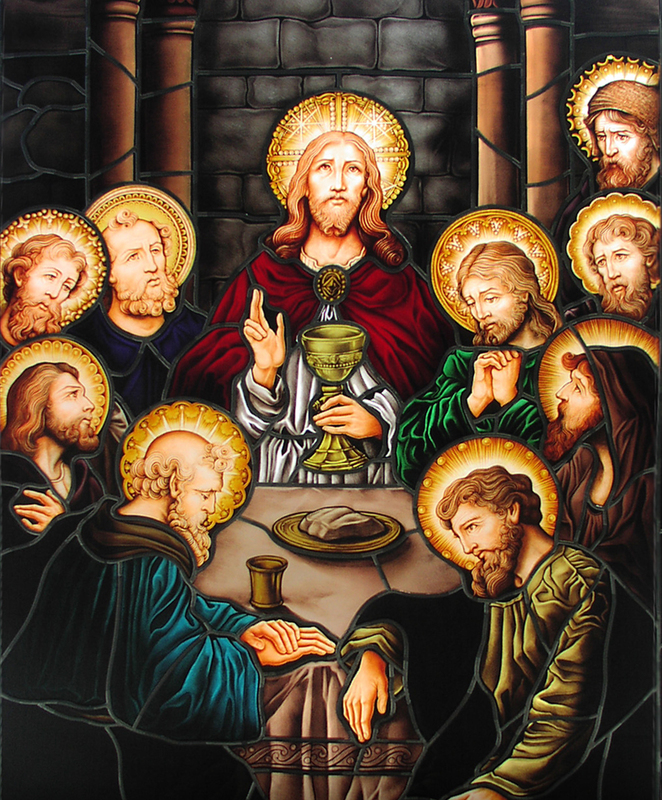 On Holy Thursday morning there is a special Mass in Cathedral Churches, celebrated by the bishop and as many priests of the diocese as can attend, because it is a solemn observance of Christ’s institution of the priesthood at the Last Supper. At this “Chrism Mass” the bishop also blesses the Oil of Chrism used for Baptism, Confirmation and Anointing of the sick or dying. The bishop may wash the feet of twelve of the priests, to symbolize Christ’s washing the feet of His Apostles, the first priests. The evening Holy Thursday Liturgy, marks the end of Lent and the beginning of the sacred “Triduum” (“three days”) of Holy Week, which culminates in the Easter Vigil, and concludes at Vespers on the evening of Easter day (see Paschale Solemnitatis, §§ 38-40). The Mass begins in the evening, because Passover began at sundown; it commemorates Our Lord’s institution of the Holy Eucharist at the Last Supper. It also shows both the worth God ascribes to the humility of service, and the need for cleansing with water (a symbol of baptism) in the Mandatum, washing, commemorating Jesus’ washing the feet of His apostles, as well as in the priest’s stripping and washing of the altar. Cleansing, in fact, gave this day of Holy Week the name Maundy Thursday. On Holy Thursday the ringing of bells ceases, the altar is stripped after vespers, and the night office is celebrated under the name of Tenebrae. The action of the Church on this night also witnesses to the Church’s esteem for Christ’s Body present in the consecrated Host in the Adoration of the Blessed Sacrament, carried in solemn procession to the flower-bedecked Altar of Repose, where it will remain “entombed” until the communion service on Good Friday. No Mass will be celebrated again in the Church until the Easter Vigil proclaims the Resurrection. And finally, there is the continued Adoration of the Blessed Sacrament by the people during the night, just as the disciples stayed with the Lord during His agony on the Mount of Olives before the betrayal by Judas. While praying in church, Conon, a Basilian monk of Naso, Sicily, resolved to make a pilgrimage to Jerusalem. In the Holy Land, he experienced a vision of a serpent coiling itself around the throat of a certain priest. At once Conon went to the priest and related the vision as a warning to him. The priest confessed to Conon that he had hoarded money for himself. Conon persuaded him to give all his riches to the poor. After returning to Sicily, Conon healed a boy afflicted with apoplexy. In 1571, over three centuries after Conon’s death, the city of Naso was stricken with a famine resulting from stormy weather that had prevented both the harvesting of the grain crop and the import of provisions by ship. The people thereupon invoked the intercession of Conon. As a sea captain was preparing to sail with a load of grain from a Sicilian port, Conon appeared to him in a vision and asked him to change his destination to a port near Naso. Torn between his fear of the rough seas and his reverential fear of the vision, the skipper in the end did as Conon had asked and completed the voyage safely. The grain from his ship reached Naso, ending the famine. They paid him thirty pieces of silver,and from that time on he looked for an opportunity to hand him over. The disciples then did as Jesus had ordered, and prepared the Passover. He said in reply, “He who has dipped his hand into the dish with me is the one who will betray me. The Son of Man indeed goes, as it is written of him, but woe to that man by whom the Son of Man is betrayed. 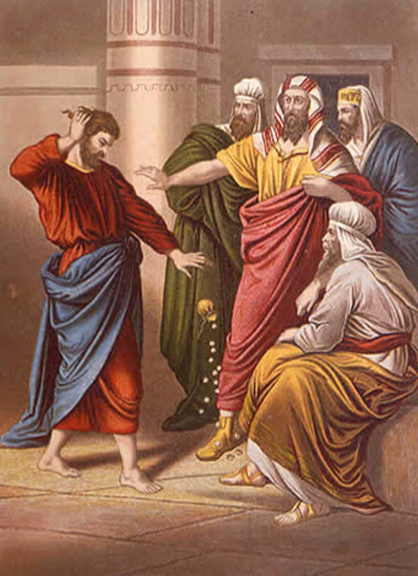 Then Judas, his betrayer, said in reply, “Surely it is not I, Rabbi?” He answered, “You have said so.” “-Matthew 26:14-25. Saint John was born in the late 7th century, and is the most remarkable of the Greek writers of the 8th century. His father was a civil authority who was Christian amid the Saracens of Damascus, whose caliph made him his minister. This enlightened man found in the public square one day, amid a group of sad Christian captives, a priest of Italian origin who had been condemned to slavery; he ransomed him and assigned him to his young son to be his tutor. Young John made extraordinary progress in grammar, dialectic, mathematics, music, poetry, astronomy, but above all in theology, the discipline imparting knowledge of God. John became famous for his encyclopedic knowledge and theological method, later a source of inspiration to Saint Thomas Aquinas. When his father died, the caliph made of him his principal counselor, his Grand Vizier. 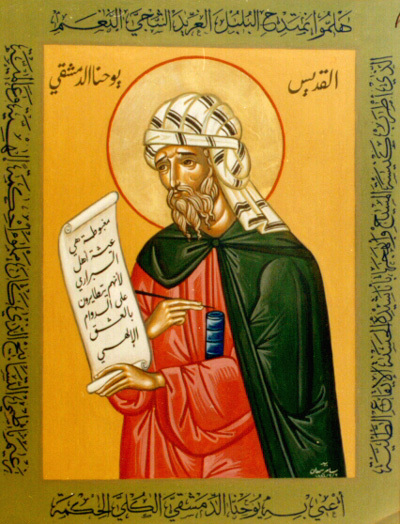 Thus it was through Saint John Damascene that the advanced sciences made their apparition among the Arab Moslems, who had burnt the library of Alexandria in Egypt; it was not the Moslems who instructed the Christians, as was believed for some time in Europe. Saint John vigorously opposed the ferocious Iconoclast persecution instigated by the Emperor of Constantinople, Leo the Isaurian. He distinguished himself, with Saint Germain, Patriarch of Constantinople, in the defense of the veneration of sacred images. The Emperor, irritated, himself conjured up a plot against him. A letter was forged, signed with Saint John’s name, and addressed to himself, the Emperor of Constantinople, offering to deliver up the city of Damascus to him. That letter was then transmitted by the Emperor to the Caliph of Damascus, advising him as a good neighbor should do, that he had a traitor for minister. Although Saint John vigorously defended himself against the charge, he was condemned by the Caliph to have his right hand cut off. The severed hand, by order of the Caliph, was attached to a post in a public square. But Saint John obtained the hand afterwards, and invoked the Blessed Virgin in a prayer which has been preserved; he prayed to be able to continue to write the praises of Her Son and Herself. The next morning when he awoke, he found his hand joined again to the arm, leaving no trace of pain, but only a fine red line like a bracelet, marking the site of the miracle. The Saint was reinstated afterwards to the favor of the local prince, but he believed that heaven had made it clear he was destined to serve the Church by his writings. He therefore distributed his property and retired soon thereafter to the monastery of Saint Sabas near Jerusalem, where he spent most of his remaining years in apologetic writings and prayer. Occasionally he left to console the Christians of Syria and Palestine and strengthen them, even going to Constantinople in the hope of obtaining martyrdom there. However, he was able to return to his monastery. There he died in peace at the age of 104, and was buried near the door of the monastery church, in the year 780.